It's about time to give something away! Why? Well, no real reason, except that it seems like a good idea. But just in case you need a reason, and a really good one, the quilt give-away is to announce and celebrate the fact that right now, through next Monday, there are no shipping charges on any items in the shop. None at all. Not to Canada, not to Topeka, not to anywhere at all. This means that you can get a sale quilt at 20% off AND free shipping. It's the opportunity of a lifetime (maybe not quite that, but a great deal). This is one of my favorite new quilts. It hadn't yet made it into the shop, and is really excited to be given away. There's a lot more information about the quilt here. Basically, it's crib or lap sized, full of bright fun colors, and just lovely. To enter leave a comment of any sort ... a compliment, favorite summer treat, a simple hi ... whatever floats your boat (one per person). To get another entry post about the contest with a link to this post on your blog and leave a link to your blog in the comment section here (one per blog). For another entry twitter an announcement of the contest and the link to this post, as well as @becauseimme somewhere in the tweet. To get five more entries buy something in the shop and let me know who you are and what you bought in this comment section. This contest will end Monday, July 20th at midnight. Beautiful quilt and great give away! Gorgeous quilt and great give-away! I'll take a stab at winning! oh wow how generous please count me in. Ooooooh it's so pretty! Send it to me, please! Beautiful quilt. I love the colors! Thanks for the chance to win this beautiful quilt! I enjoy reading your blog. It's very colorful and makes me want to learn to quilt. Oh.My.Goodness! That's gorgeous! Great givaway! I have been following your blog for a few months now, yes, call me a lurker - hah! Your quilting work and personal life inspires me so much. My 2 yr old girl Carmen is the love of my life and I applaud you for being such a strong person and wonderful mother to all of your children. Kudos and smile! Another one of your beautiful creations!! I would love to have it in my house. Oh it's so beautiful- I've admired this one for a while. I just love the bright colors! I'll tweet and come back and let you know. I am in love with that quilt! Please enter me. Its beautiful! And I posted about it too. I tweeted about it...don't know how to show that, though...not very good with the twitter thang. 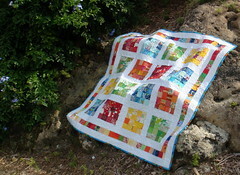 Love your blog and so hope I win your quilt...it is gorgeous!!!! Please continue to share all your creative talent! Oh, gorgeous quilt! Love it! I've got your beautiful cuddly blankie in my "shopping cart" over at Etsy, but I need my husband to help me PayPal it when he gets home!! Thanks again for all the chances, Jody. May you be blessed with lots of business! Visiting via One Thing. So incredibly beautiful and what a generous giveaway!! What a fun and beautiful give away! This makes me want to learn how to quilt! 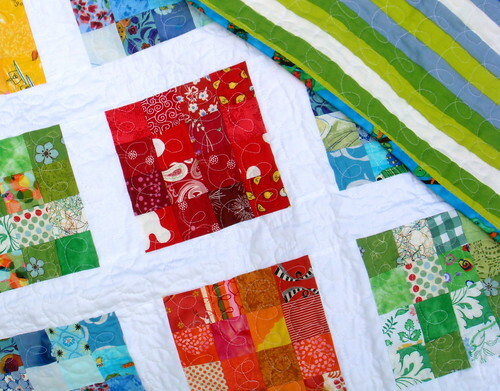 I love the beautiful, bright colors of the quilt! I'd love to win it! Found you through another blog and can't wait to look in your shop! And I'll be linking to you in Friday's entry :-) Beautiful work. I absolutely love your work. This quilt just makes me happy! What a great quilt. How nice of you to give it away. Ooooh, I have been loving this quilt since you first posted it! I hope I might be the one to get it! That is a beautiful quilt! From a beginner-ish quilter...LOVE your quilt! Great colors! Oh, I love that quilt!!!! I am in love with that quilt. Please pick me!! I love the colors, so bright and cheerful! I hope I win! Great Blog! Oh I would LOVE that quilt for my new baby coming in December! It's gorgeous! Beautiful...I know just the baby I would give this to if I win!!! I covet that quilt. It is so beautiful. Thanks for giving it away. I'm keeping my fingers crossed! Wow! That is one gorgeous quilt. You do beautiful work! Wow! What a darling quilt! I can't believe you are willing to give it away. But since you are, I'd love to be entered. Thank you. That is gorgeous! I'd love to be entered in the giveway. Now I'm going to go drool over your other creations...Thanks! I would love to win, every quilt needs a special home and I could provide one for your lovely quilt. Oh my goodness! This is my favorite quilt you've made. I love the colors and design. And I'd LOVE to win it for my baby boy who is arriving in a few weeks. It is gorgeous! I Love Love Love it! I think I should win because I am from Topeka and you said it in your post! :) Beautiful quilt would love to win. That's an absolutely wonderful quilt - and I happen to be in need of a baby gift this fall!!! Also - love the shirred items! You do beautiful work! Count me in! Wow, what a beautiful quilt!! OH! I'm a quilter, too! Therefore, I need to win a quilt because I always give my quilts away as gifts. The quilt your giving away looks like a picnic ready to happen. Nice work. Beautiful quilt, as usual. I do hope I win!!! Okay so my name is "Jody" to, I must admit that many times I sign my name "Just Me", so your blog intrigues me with your name & the statement "because I'm Me"...you sound a bit like me! Your quilt is very inspirational, it shows love of colors, love of quilting, besides it is a "very beautiful quilt, made with loving hands". Your free give away is perhaps a wonderful way to give back to those who inspire you, or those who make you feel good, either way....your quilt of "beauty" is very lovely..
Oh! What an offer! I love so many of your wonderful quilts and constanly wonder how you gather the time to work on them and how you organize yourself! Fantastic work and would be honored to be entered in the contest! Thanks!! I love that quilt....I have been loving it since you first posted. Gorgeous. By the way...your kiddos are cute too. So beautiful. Please count me in. SO pretty!! Lately I've been having a love affair with white backgrounds and bright favrics. I'm still trying to win a give-away. Wish me luck. Beautiful work! Would love to win the quilt. You have such beautiful products. It is lovely! Thanks for doing the giveaway. Me please, I'd like to enter. I Love Love Love your quilt!! Quilts are seriously a timeless comfort item. I have one from my wedding that my aunt made me. It goes on every trip and its wrapped around me as I snuggle up to my husband on the couch for a movie! Hi from Australia! The quilt looks beautiful!! WOW!! What a beautiful quilt. That is so beautiful! Such fun, happy colors. 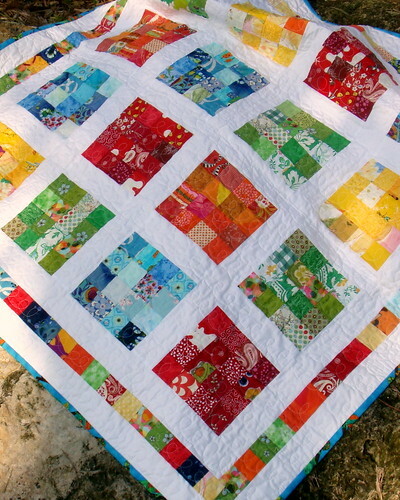 What a cheerful, bright, beautiful quilt! Thank you so much! 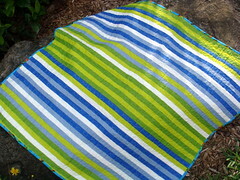 what a perfect "sit on the porch swing" quilt!!! Great quilt! It's so cheerful! I love the bright colors, really beautiful! I love all your quilts. Please count me in. I can't get over how gorgeous that quilt is! I LOVE the brightness of it. The quilt is beautiful! I hope luck is on my side on Monday ... ;o) You're very generous to give away such a gorgeous piece of art. Great quilt I love the bright colors. My grandson would love it he loves quilts. Wow, generous giveaway! Thanks for the chance to win! That quilt is gorgeous, I'd love a great lap quilt that also doubles as couch art when not in use! This quilt looks so beautiful! I've never own one, so I'd like to try my luck on this giveaway. Thanks! Those quilts are breath-taking. I've never seen anything quite like the first one. Pick me! Pick me! We have a new baby on the way and that would be just perfect! Just beautiful - I love the colors - so happy and bright. I would love to have something like this, especially as where i live we have a lot of gray days. Nothing like a cheery bright quilt to make the days better. I would love to have a go at winning this. Thank you. Gorgeous! Thanks for the chance. Is there anything on earth that speaks of love and home like a quilt? Love your BLOG keep it up! Love your work, if i don't win i have to make one myself! What are beautiful giveaway. You are so generous. Oh, I would love this! It's a gorgeous quilt!